Emergency Room is the kind of game that could only come from mid-90s multimedia novelty meeting George Clooney/ER mania. 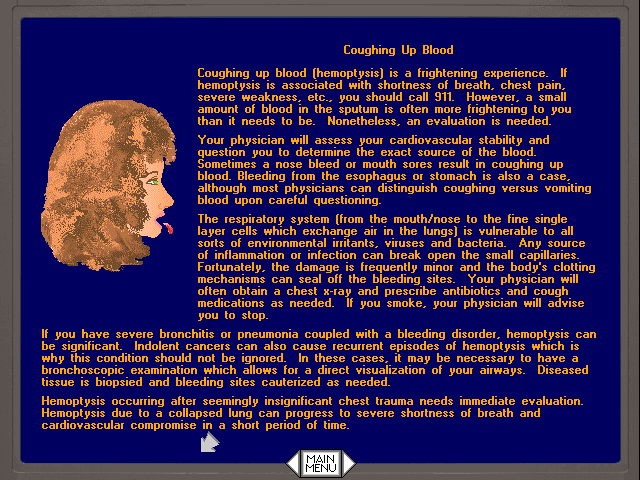 It’s the kind of serious simulation you’d be hard-pressed to see made today (I know, because I’ve looked). You won’t need to study, and I suppose you technically won’t need to learn anything, but the game will demand your attention. While it could certainly function as a mid-level training tool, if you’re just looking to “play doctor” (like me), you’re still going to need to make a commitment to following realistic procedure if you plan on getting anywhere. 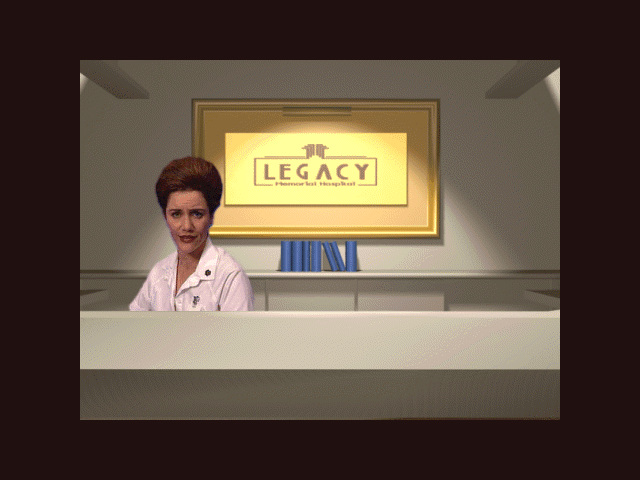 You play as a new emergency room physician at Legacy Memorial Hospital, working your way through the ranks from internist to taking over as Chief of Staff. ER docs don’t see people for wellness checkups, so you’ll be dealing with a lot of cuts, scrapes, and upset tummies, up to the dramatic stuff like gunshots, glued eyelids, stab wounds, and de-gloved fingers. ER docs also aren’t surgeons, so your job in the more serious cases is strictly to stabilize a patient before handing them off to a dedicated specialist. It’s a range of responsibility that gives you broad access to widely varying cases and equipment, and as an exciting pastiche of the medical field, it works surprisingly well. 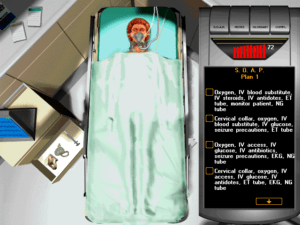 You “win” the game by successfully treating 50 patients. This means following a mostly step-by-step process on each case before you discharge them and select the next. The easiest way to cover this game is by following that very process, so grab your scrubs and follow me on a round. Every session begins in the waiting room, where a randomized series of patients await your attention. Clicking through each gives a general description of their symptoms, and you pick the one that interests you. Crucially, you’re never required to take one case over the other. An EMT will sometimes be standing in the lobby, and he will always offer someone with a form of life-threatening trauma, but he’s just another option. Declining to see the comatose driver in favor of the child with a runny nose doesn’t come with a penalty of any kind. 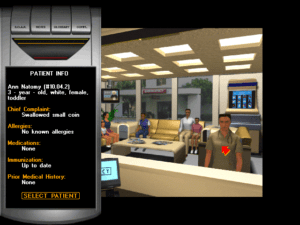 The lobby is also where you’re introduced to the handy “Med-o-Matic” PDA. This quasi-futuristic contrivance acts as your interface, and lets you review test results, ask for hints, and crucially, fill out your S.O.A.P. for each patient. That checklist stands for Subjective, Objective, Analysis, and Plan, and you’ll be asked a few multiple choice questions at each stage of treatment. Subjective, for example, will be a brief quiz on what the patient just relayed to you regarding symptoms, medication, and medical history. The Med-o-Matic tracks your score at the top. Correct S.O.A.P. answers, along with only doing necessary actions, increase your patient’s score. Patient selected, you’re encouraged to make a stop by the Continuing Medical Education kiosk before leaving the lobby. 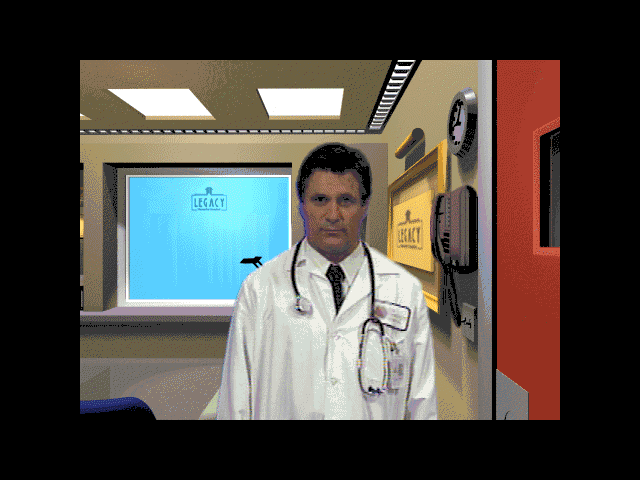 This is the gateway that allows anyone without medical experience to effectively participate in what would otherwise be a stiff training simulator. You call up your patient’s basic issue (“hurt elbow,” “hit by car,” etc.) and will get some background and instruction on what to do next. If you want to take some notes, the CME will lay out precisely what you need to do in the Exam and Lab rooms. If you want to just wing it you can skip the CME entirely, at the risk of your score. Next stop is the exam room, where your patient lies on a table next to three drawers of instruments. The contents and placement of instruments randomizes between patients, but you’ll always have what you need available, mixed in with some red herrings. Instruments are used by clicking to pick them up, and then clicking again on the specific location on the patient (the Med-o-Matic helpfully labels what part you’re mousing over). This is where you’ll use stethoscopes to hear lung sounds, gloves to poke and prod, EKGs to measure heartbeats, and so forth. If you need help, the nurse can offer hints at the cost of your score. From here, you may need to hit up either Imaging or Lab tests. These use a similar interface, and have you selecting areas of the patient to x-ray, collecting blood and urine, and often, selecting the specific test you need to run. You will need to know when to order a CBC, type and cross match, urine cytology, and so on (the CME article will have told you). You will not need to know how to read these tests, as the outcome is instantly interpreted for you in terms of “elevated,” “abnormal,” or perhaps, perfectly fine. Unnecessary tests – you guessed it – lower your score. At this point you should have a clear idea of what’s going on, especially because the CME pretty much made the diagnosis for you at the start. The CME does not cover treatment, however – for that, you head to the library. Here you can search an enormous database (498 entires – I counted), broken out by areas of the body or groups of injuries (leg fractures, poisonings, etc). The text here is an extended version of what you read at the CME kiosk, and will list exact treatments needed, as well as a better description of the specific injury. Again, you can skip the library if you think you’ve got this. There are enough similarities in the multiple choices to throw you off, but it is possible for medical players to guess their way through. Finally, it’s off to treatment. The interface here is essentially identical to that in the exam room, but with an entirely different set of tools in the drawers. This is where you’ll insert IVs, attach oxygen masks, deliver medications, or even the “mundane” stuff, like cleansing and bandaging a wound. Two paper pads can be used to select hospital orders or discharge instructions, for the things the interface doesn’t directly let you do (like advise a patient, restrict foods, or refer to a specialist). When you’re done here, you head into the next room for a debrief from the hospital administrator. You can elect to view your choices at every stage of treatment and learn what wasn’t needed or what was missed. Alternatively, you can skip the step-by-step critique and head directly into the lobby for your next patient. The score on the Med-O-Matic indicates how well you did. A score over 80 is a success, in terms of counting toward completing the game. A score of 90-100 (depending on patient) is flawless, which can be achieved just by following the CME article to the letter. 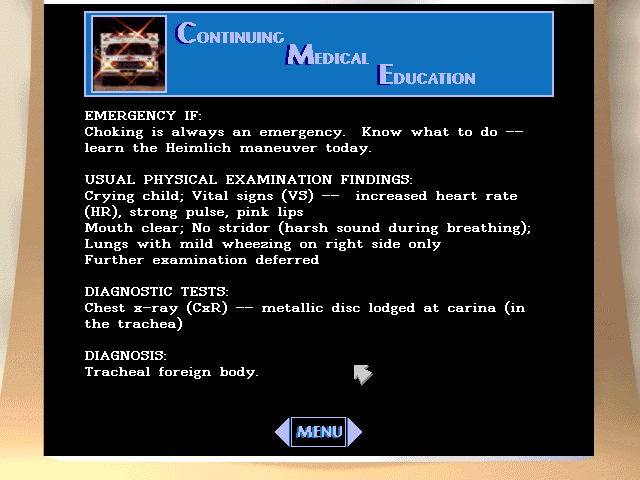 At a score of 15, your patient either dies or is taken away from you. You’ll need to work to get this to happen, though some critical patients start at a much lower score, giving you fewer chances to mess up. That’s the whole game. So the first, and most, obvious question – is this any fun? I would say yes, to the right person. This isn’t a goofy simulation for laughs and YouTube streaming. 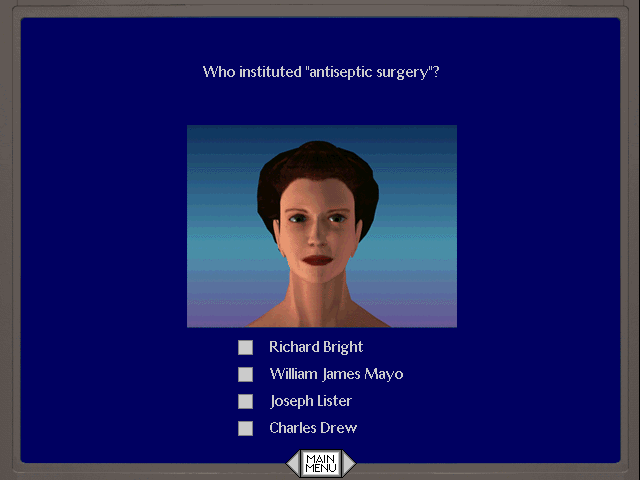 You can attach pointless nose splints and bandages (some of which will even appear on the patient), but the opportunities for mayhem are very low – consequences are lots of angry staff messages and lectures, but nothing amusing. And just like Life and Death, you always get another chance no matter how many patients you kill. All patients are hand drawn, with similar art for wounds. It certainly gets bloody, but never photorealistic. It’s also not perfect. The rigid delineation between rooms sets up an unrealistic assembly line approach to treatment. 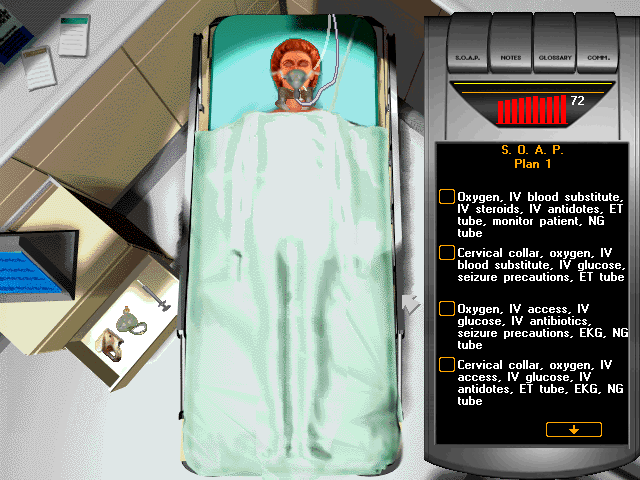 A patient suffocating won’t get oxygen until you get to the treatment stage – there’s no going forward to address the blocked airway and then going back for the rest of the exam, just like there’s no inserting an ET tube and then returning for x-rays to confirm placement (even though the CME will tell you to do this!) Likewise, there’s no time limit to any case. Instead, serious emergencies will have greater penalties for doing anything out of step or unneeded – including simple things like taking pulse or blood pressure. The game also has a curious difficulty setting. All its cases are stealthily rated 1 to 5, with 5 most difficult. There are six “slots” in the waiting room where a patient can appear. If you successfully treat the patient in one slot, the next patient in that slot will have a case rating one higher. If you fail, you get one lower. This means that if you’re doing well, you’re actually going to see the same recycled pool of difficulty 5 cases, and to experience something new, you’re going to have to intentionally fail one. I kept wondering why I was seeing frequent repeats out of a database of 400+ emergencies, and this is why. The library is a extensive grab bag of medical knowledge. 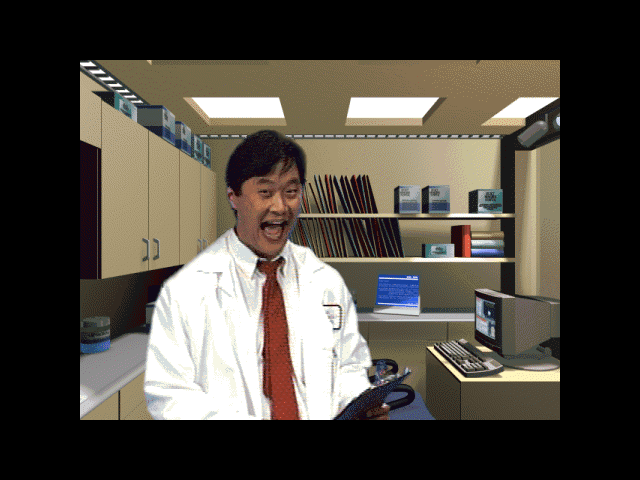 Steve Park (In Living Color) is the imaging technician “Dr. C. N. Side Yoo,” and he’s cracking wise in an exaggerated Jim Carrey style every time you enter the room. Joey Lauren Adams (Chasing Amy) is “Nurse Kerri Taker” and awkwardly flirts with you every other clip. No, I don’t think we should get a cup of coffee later. Ellen Bry (the game’s other Elsewhere vet) seethes contempt as the overworked triage nurse. The hospital’s futuristic talking computer Terabyte even stops to ask a medical quiz every time you log in. Leave me alone! The dying patient out there is like the ultimate final exam, and I’m in here to cram! I can’t say I get the point of these characters, especially with the tone so offbeat. With the exception of having Dr. Boss review your performance “in toto,” none of these video clips add anything practical. In the case of the random patients or “hospital chaos” clips as you move between rooms, they actively work to slow the pace down. Luckily, you can skip any video clip with the space bar. Using the “GO TO” room option on the menu bar also lets you skip any slow hallway transitions. Without these tools, these handful of repeated clips would get grating fast. With them, they’re reduced to ignored 1990’s flash. Finally, there’s even more multimedia if you want it. TV’s in the lobby and doctors’ lounge play public service announcements from the U.S. Ad Council. The lab has a cabinet full of antique medical tools you can investigate. A skeleton in the imaging room speaks the name of any bone you click. And similar to SWAT’s encyclopedia, Terabyte has reams of medical history, glossary of terms, and the like, if you want to spend time clicking through and reading. It was an inexpensive way to boost value of the CD-ROM in the 90’s (pity the person who had to type it all in! ), but today it’s arguably useless. Still, it’s a reinforcement of this game as a fairly legitimate learning tool. 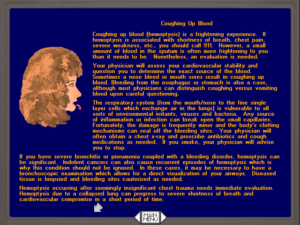 If you have some curiosity or interest in real medicine, this is going to be a much better interactive look than something you’ll find on an app store. As someone who was never going to be memorizing this stuff, the CME made every case playable, but quickly routine. I literally wrote down what to do, and then did it. For someone a little more invested, you could optionally limit how much you read in the library, or simply rely on the multiple-choice parts of the S.O.A.P. to suss out what to do next, and theoretically have an authentic challenge. In that, it’s a wonderful tool that will let you naturally choose your own level of involvement. But, again, if you’re not at least somewhat committed, this will get boring quickly. And as a game, the “fun” to be had here is arguable. 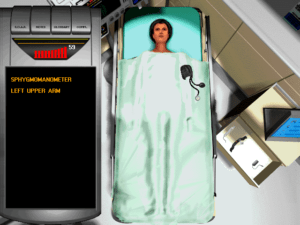 Sharp medical simulator that lets you decide how involved you want to get. Wide variety of cases. Generally smooth interface. No real interaction with patients, just a very mechanical process to treatment. Uncommon treatment steps are sometimes unclear (using IV bags twice for different medicines, etc). Definitely not fun for everyone. I played this game as a child, and even found the old disc! But, I can’t find a way to play it on a modern computer. Is there some way you can offer up a streaming or download link for it? Your in depth review made me want to relive the nostalgia!! If you have the original disc, your best bet to play on a modern computer is DosBox. If you’re familiar with old DOS commands, you shouldn’t have too much trouble getting this set up. If you have ER2, or any of the later ones (made for Windows) it’s going to be much harder to get working. You would likely need an entire virtual machine, which get more complicated than DosBox.